Context: Recent studies indicated that significant proportion of facial fractures attributed to road traffic mishaps in the middle- and low-income countries are caused by motorcycle (MC) crashes. However, there is limited information on crash characteristics of such injuries. This study was designed to examine the crash characteristics, pattern of fracture, and sociodemographics of patients with facial bone fractures due to MC crashes in our institution. Subjects and Methods: Data on patients' sociodemographics, pattern of presentation, type(s) of fracture, patient status, crash characteristics, level of consciousness, and treatment offered were collected and analyzed. Results: A total of 151 patients, aged 7–59 years were reviewed during the study period. A male preponderance was observed (M:F = 4:1) and the patients were predominantly motorcyclists (64.8%, n = 98). The most common mechanism of crash was collision with another MC (51.6%, n = 78). A total of 194 fractures were reviewed and the mandible (58.8%, n = 114) was more commonly affected than the midface (41.2%, n = 80). The predominant site on the mandible was the body (31.6%) while zygoma (32.5%) was the most affected part of the midface. Patient status was found to have a statistically significant relationship with loss of consciousness (P = 0.02). Eighty-two fracture sites (42.3%) were managed with open reduction and internal fixation. Conclusions: Facial bone fractures occur in a significant proportion of MC crashes and riders are predominantly affected. In addition, a larger proportion of commuters rarely wear crash helmet which could have offered protection. Continual advocacy on preventive measures and enforcement of road safety regulations is hereby advised. Background: The breast is a common site for pathologies which predominantly involves the female breast. While benign diseases are more common, malignancies are of utmost concern for the patient, clinician, and the pathologist. Aim: The aim of this study is to audit the clinical and pathological features of patients with breast lumps in a tertiary center in Nigeria. Materials and Methods: This is a retrospective observational study of histologically diagnosed breast lumps over a period of 8 years. Results: Lumps were common in the 20–39 years age group (>50%), with a mean age of 34.95 years. Females accounted for 759 (98.1%) of cases. In 467 (60.4%) cases, the lumps measured >5 cm and only 175 (22.6%) cases presented to the surgeon within 12 weeks of noticing a breast lump. Ninety-one (11.8%) cases also presented with axillary lymph nodes, breast pain 79 (10.2%), peau d' orange 56 (7.2%), and ulceration 47 (6.1%). Benign breast disease (BBD) occurred in 401 (51.8%) cases and malignant breast diseases (MBD) occurred in 344 (44.3%) of cases. Conclusion: BBD and MBD are common among the young in Uyo. Lumps are the primary complaint and late presentation is the norm. Background: A well awareness of the variation of inferior alveolar canal is mandatory to avoid iatrogenic complication. 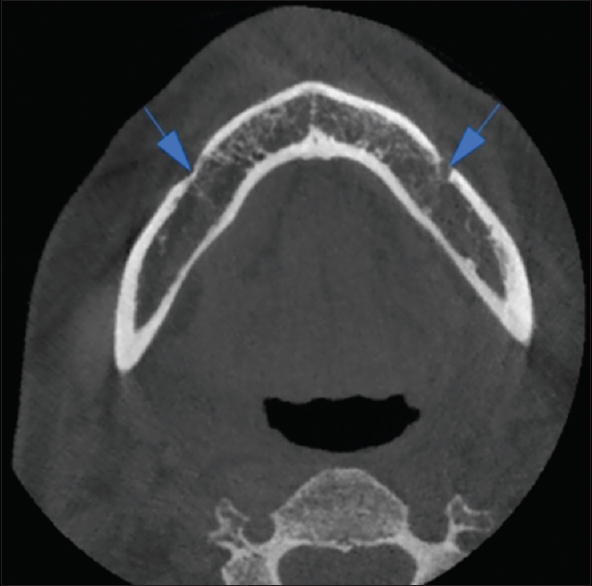 This study was conducted among 90 patients to determine variation in inferior alveolar nerve (IAN) loop through cone-beam computed tomography (CBCT) images. Materials and Methods: CBCT images of 90 patients were involved in this study. All images were studied by the expert radiologist to see Type I, Type II, and Type III pattern of IAN canal (IANC). Results were subjected to statistical analysis for correct inferences. Results: Forty males and 50 females were included in the study. The difference was statistically nonsignificant (P = 0.5). Type I pattern was seen in 26 patients, Type II in 19, and Type III in 45 patients. The difference was statistically significant (P < 0.05). The most prevalent pattern was Type III (males - 15 and females - 30), followed by Type I (males - 14 and females - 12) and Type II (males - 11 and females - 8). There was statistical significance difference between males and females in Type II (P < 0.05). Conclusion: The anterior loop of IAC is quite common and IANC may show variation in structure. The most common pattern recorded was Type III. CBCT is very useful in the detection of IANC. Introduction: Breast cancer is leading cancer in women, and the incidence of breast cancer in India is on the rise. The most common histologic type of breast cancer is infiltrating ductal carcinoma. Prognostic and predictive factors are used in the management of breast cancer. Estrogen receptor (ER), progesterone receptor (PR), and human epidermal growth factor receptor-2 (HER2/neu) are immunohistochemical markers of prognosis as well as predictors of response to therapy. Aims and Objectives: The study was conducted to evaluate ER, PR, and HER2/neu expressions in invasive ductal carcinomas of the breast by immunohistochemistry, to explore the correlation of these markers to each other and to various clinicopathological parameters: age of the patient, histological grade, tumor size, and lymph node metastasis. Materials and Methods: This prospective study was conducted on 100 cases of infiltrating ductal carcinoma. Slides were prepared from blocks containing cancer tissue, and immunohistochemical staining was done for ER, PR, and HER2/neu expressions. Interpretation of expressions was done using Allred scoring system for ER/PR and the American Society of Clinical Oncology/College of American Pathologists guidelines for HER2/neu. Statistical analysis was performed to determine the statistical significance by applying Chi-square test. Results: Majority of tumors were ER and PR positive and HER2/neu negative. ER and PR correlated significantly with age, tumor size, and tumor grade; whereas, HER2/neu correlated significantly with tumor size only. 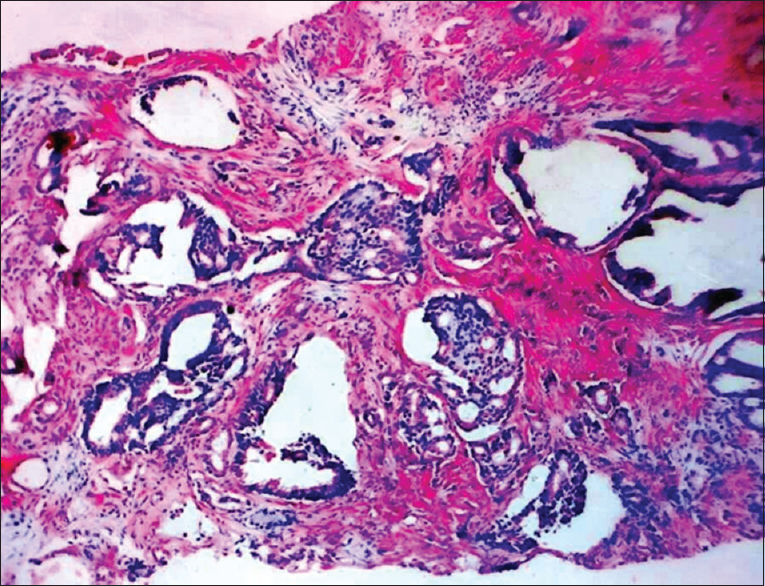 No association was seen with axillary lymph node metastasis. ER and PR expression correlated with each other, but none correlated with HER2/neu. Conclusions: As the majority of the tumors are ER, PR positive and since ER and PR correlate with each other as well as with age, tumor size, and grade. Therefore, routine assessment of hormone receptors is recommended for prognostic and therapeutic information in breast cancer cases. Context: Peritonitis induces an inflammatory response characterized by the elevation of various cytokine levels. Included in this cascade of cytokines are tumor necrosis factor-alpha (TNF-α) and interleukin-1 alpha (IL-1α). The outcome of patient care may be associated with the pattern of elaboration of these cytokines. Aim: The aim of this study was to describe the pattern of cytokine response (TNF-α and IL-1α) in the course of peritonitis and evaluate them as predictors of mortality in peritonitis. 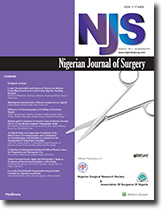 Setting and Design: This was a prospective study conducted in the Division of Gastrointestinal Surgery, University College Hospital, Ibadan. Methods: Consenting patients with clinical diagnosis of generalized peritonitis over a 6-month period (July to December 2015) were recruited. The serum samples of these patients were obtained at presentation, immediately after surgery, and 24 h and 48 h after surgery with a follow-up period of 30 days. Results: Twenty-six samples out of thirty could be analyzed. Serum TNF-α and IL-1α levels were both elevated at presentation in all patients. However, the patterns of change after intervention varied between the survivors and nonsurvivors. Conclusion: Peritonitis triggers a simultaneous increase in serum levels of TNFα and IL-1α. 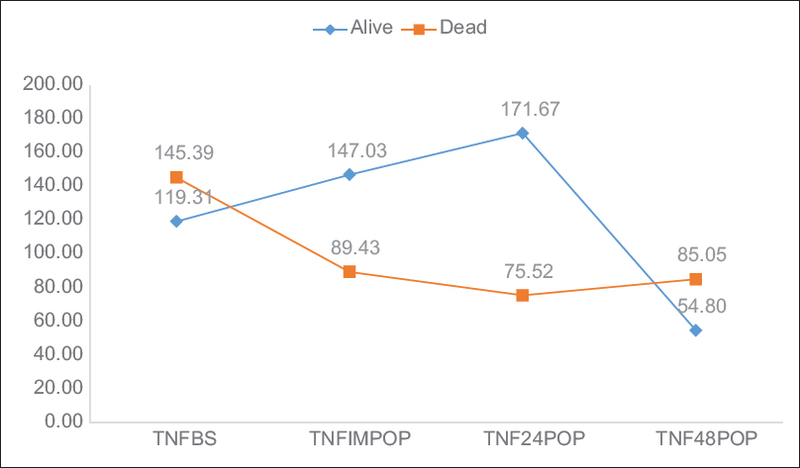 Lower serum level of TNF-α is associated with survival, while on the contrary, higher level of IL-1α is associated with survival. Background: Surgery and anesthesia are essential parts of global healthcare. Surgical intervention has been largely beneficial but remains associated with significant morbidity and mortality. The increasing complexity of surgical interventions has made providers more prone to avoidable errors. The World Health Organization Surgical Safety Checklist (WHO SSC) was disseminated worldwide with the aim of reducing perioperative morbidity and mortality. Objective: There is a paucity of data to assess awareness and use of WHO SSC in low- and middle-income countries. The aim of this study is to evaluate the knowledge and use of WHO SSC by Nigerian anesthetists. Methodology: A structured self-reporting questionnaire was distributed to Nigerian physician anesthetists. One hundred and twenty-two questionnaires were distributed with 102 completed reflecting a response rate of 83.6%. Results: Awareness of the WHO SSC was reported by 93.1% of the respondents. Routine use of the checklist was reported by 62.7% of the respondents mostly in the teaching hospitals compared with the general hospitals and comprehensive health centers (86.2%, 23.3% and 14.3%, P = 0.0001). The respondents who had a perception that WHO SSC does not prevent errors were the least likely to use it (odds ratio: 0.08, P = 0.0117). Conclusion: This study identified a high level of awareness and use of the WHO SSC by physician anesthetists in Nigeria. However, its use is mostly use of The WHO SSC list by Nigerian anesthetists in teaching hospitals. Background: In emergency settings, several surgical procedures are described while dealing with pathology of terminal ileal lying within 15 cm of the ileocecal valve, but there is still confusion and controversy over the optimal surgical treatment. Methods: A nonrandomized study of 210 patients with near terminal ileal pathology (within 15 cm) was carried out over a period of 10 years. The study included 112 cases in which an ileocecal anastomosis with inclusion of appendicular stump was used in terminal ileal pathologies, and in rest 98 cases, other surgical procedures were used. The outcomes were measured in relation to postoperative complications and mortality. Results: Postoperative complications encountered in emergency ileocecal anastomosis with the inclusion of appendicular stump were wound infection in 31 patients (34.72%), respiratory complications in 10 patients (11.2%), septicemia in 6 patients (6.72.%), and anastomotic leak in one patient (1.12%). Conclusion: The technique of ileocecal single-layer anastomosis with the inclusion of appendicular stump was found to be very effective in dealing this common problem and had less morbidity and mortality. Introduction: Laparoscopic sleeve gastrectomy (LSG) has become a popular weight loss technique in morbidly obese patients. The aim of our study was to evaluate the changes in plasma ghrelin levels in relation to weight loss following LSG and to study the efficacy of LSG in terms of long-term glycemic control and resolution of diabetes. Methodology: The study was conducted on 70 morbidly obese patients (body mass index [BMI] >40 kg/m2) or severely obese patients (BMI >35 kg/m2) with comorbidities who underwent LSG in Dayanand Medical College and Hospital, Ludhiana, India. 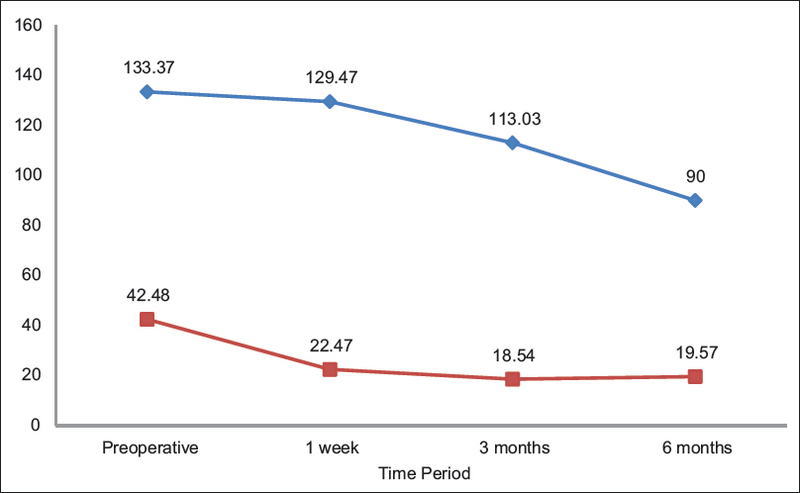 Ghrelin levels were measured preoperatively and postoperatively at 1 week, 3 months, and 6 months along with measurements of various weight loss parameters and glycosylated hemoglobin. Results: A significant decrease in plasma ghrelin levels was observed in relation to the mean weight and percentage excess weight loss at 3 months postoperatively. However, at 6 months, fall in ghrelin reached a plateau phase while weight loss was still sustained and significant. There was a significant fall in glycosylated hemoglobin levels with patients achieving good control/resolution of diabetes Type II. Conclusion: LSG is an effective weight loss surgery and brings about excellent weight loss in morbidly obese individuals in addition to achievement of good glycemic control in diabetic individuals. Serum levels of ghrelin fall significantly after sleeve gastrectomy. However, long term implications of ghrelin induced weight loss cannot be elucidated. Introduction: Maxillectomy is a surgical procedure for managing tumors affecting the maxilla; the goal of maxillectomy however should not be limited to tumor extirpation but should include restoration of oronasal function and facial contours, as failure to do these may give rise to psychosocial and functional challenges. This study aimed to appraise the pattern of maxillectomies, challenges of management, and quality of life (QOL) of a proportion of the study population. Materials and Methods: This was a cross-sectional study carried out at the Department of Oral and Maxillofacial Surgery, University College Hospital, Ibadan. Patients' case files from year 2000 to 2016 were retrieved and reviewed. Data extracted for analysis included age, gender, site of lesion, and histologic diagnosis; lesions were grouped as benign or malignant. Contacts were made with patients or their next of kin for a clinic review appointment where QOL was assessed with the University of Washington Quality of Life version 4 Questionnaire. Data were analyzed and result presented as means and frequencies. Results: Out of the 78 cases of maxillectomy recorded in the department within the study period, records were available and adequate in 67 cases. 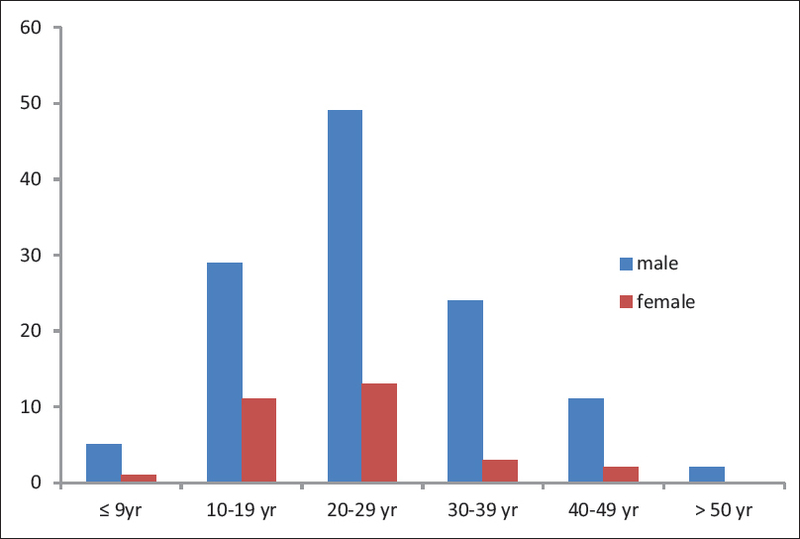 There were 37 (55.2%) females with a mean age of 35.88 ± 14.9 years. Swelling was the most common reason for presentation (63, 94%). The mean period between onset of disease and presentation for treatment was 3.66 ± 3.35 years. Distribution of lesions was benign 35 (52.2%) and malignant 32 (47.8%). 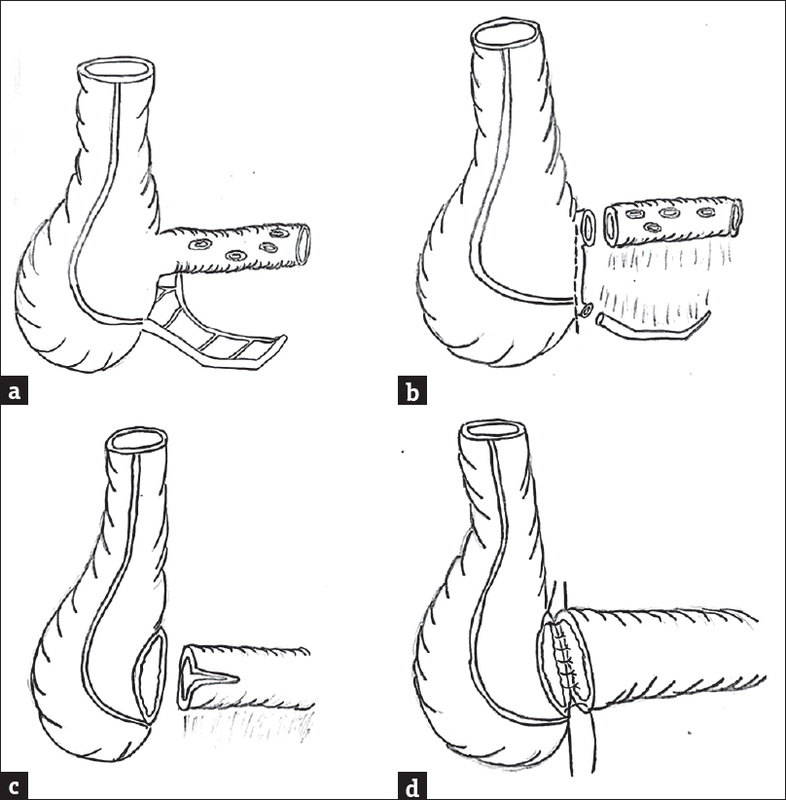 Hemi-maxillectomy was the commonest surgical procedure (23, 34.8%). While majority had some prosthetic rehabilitation, 31 participants (48.5%) obtained no prosthesis. Eight participants gave scores of ≥75% when comparing their present health-related QOL (HR-QOL) with a month before surgery; the overall QOL was ≥60%. However, HR-QOL and overall QOL in the last 7 days before assessment were rated as good in 55.6% and 66.7%, respectively. Chewing was the most important domain to participants. Conclusion: The pattern of presentation and indications for maxillectomy in this series are similar to that from previous studies. The uptake of prosthetic rehabilitation was low and overall QOL was rated as fair. QOL should be considered as part of treatment outcome measure for maxillectomy. The most frequent presentation of esophageal cancer is adenocarcinoma and squamous cell carcinoma. 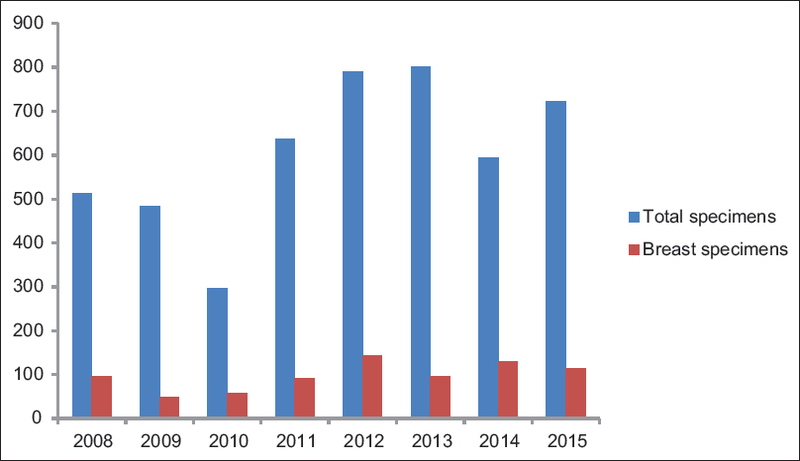 In recent years, the latter has decreased its incidence increasing the adenocarcinoma. Currently, another type of tumor with a much lower incidence has been described, which has a neuroendocrine component along with another exocrine glandular component and has been classified since 2010 as mixed adenoneuroendocrine carcinoma (MANEC). 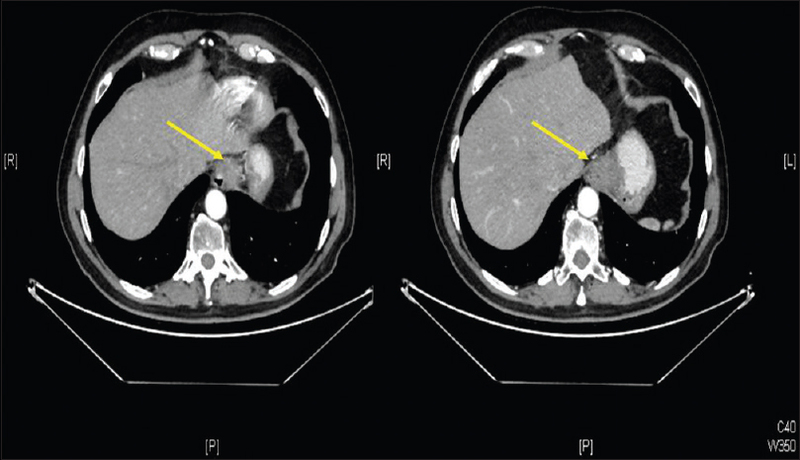 We present the case of a 68-year-old male with a history of dyspepsia and epigastric pain who after performing a gastroscopy, was diagnosed with a malignant neoplasm of the esophagus. The patient underwent a total esophagectomy with reconstruction by tubular gastroplasty with cervical anastomosis. The final result of the piece after immunohistochemistry revealed that the tumor was composed of one component of adenocarcinoma in 60% together with another component compatible with neuroendocrine in 40%. With these findings and according to the World Health Organization classification of 2010 was diagnosed as esophageal MANEC. MANECs are rare tumors, described in other locations of the digestive tract, the esophagus being an infrequent location. Its preoperative diagnosis is difficult, and it is not until the final analysis of the complete piece by means of specific immunohistochemical techniques when its diagnosis can be established. Its treatment is fundamentally surgical, whereas the adjuvant therapeutic schemes with chemotherapy are not well defined at present because of their low incidence. Secretory breast carcinoma (SBC) is a very rare low-grade subtype of breast carcinoma. It was initially termed “juvenile breast cancer,” but it is now known to occur in adults of both sexes, and only few male cases have been reported in the literature. SBC is of importance because of its unique morphology and excellent prognosis. 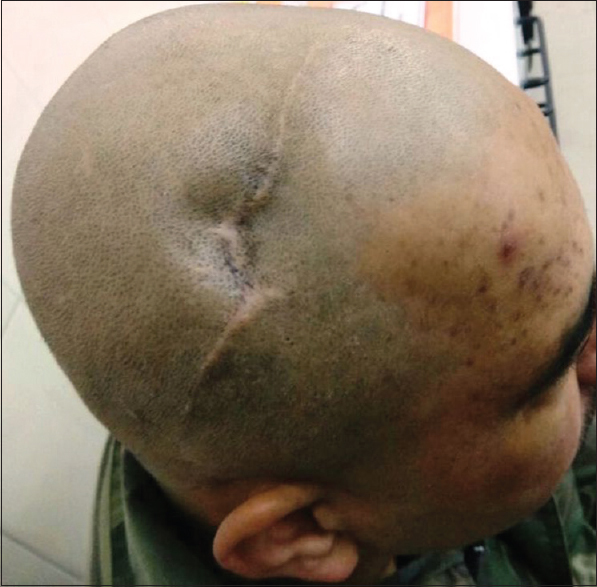 We report here a case in a 20-year-old male presenting with right pedunculated and ulcerated breast mass with associated contact bleeding. Histopathology was performed and it revealed a secretory carcinoma. This tumor is morphologically characterized by the presence of abundant eosinophilic secretions in intracellular vacuoles and intercellular spaces. The objective of this article is to review the epidemiological and clinical aspect of secretory carcinoma from a case report and literature review. Prostate cancer remains the most common noncutaneous cancer in men, especially in this era of prostate-specific antigen assay. Prostate cancer metastases have been known to commonly affect the lymphatics, bones, and lungs. Prostate cancer metastasis to the skin is very rare (<1%) and often signifies a terminal disease. Involvement of the skin has been thought to be through lymphatic spread by embolization or permeation, hematogenous spread, and implantation during surgery (port site in radical prostatectomy). We report a 74-year-old man on management for advanced prostate cancer with subcutaneous goserelin (Zoladex) but developed skin metastasis in the course of treatment. The skin metastasis in our patient, however, was initially localized to the site of the regions of subcutaneous goserelin injection that we imagined if there is a link between the two. We reviewed the literature and currently found no connection. Is there truly a link?